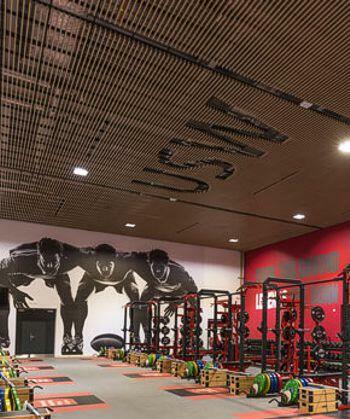 SUPSWOOD’s slatted ceiling tiles and panels have been used dynamically in a prestige gym fitout at the University of Southern Wales Sports Park in Cardiff, UK. The client’s brief asked for a simple lightweight solution to quickly install into the ceiling grid while maintaining access to the services above. A matching product for the entry atrium walls was also required. Additionally, the client’s brand identity needed to be incorporated into the products. SUPATILE SLAT slatted tile system was the ideal choice for this project as it is lightweight, aesthetically pleasing and customisable, and is designed to be installed directly into a ceiling grid to allow for 100% accessibility into the ceiling cavity. This dynamic ceiling graces the gym area of a superb purpose-built facility, designed to train and develop athletes to their highest potential and to cater for elite performers internationally. The client’s identity has been ingeniously incorporated into the gym ceiling tiles. Here the tiles are in a profile 5 in a Lift & Shift format and finished in Fire Retardant Oak laminate. SUPASLAT panels in a matching profile and finish have been used on the walls below the balustrade of the gym’s small entry atrium. These panels also have the client’s identity incorporated into them, the open areas of the letters highlighted with a lighter background to that of the slatted areas. This project illustrates how SUPAWOOD’s slatted products can be adapted to exactly achieve the client’s design brief.